It's been a while since I've done one of these. But with recent games like The Legend of Zelda: Breath of the Wild blowing minds, Ys VIII poised to release over on this side of the pond, and Final Fantasy XV bringing some spotlight back on Square Enix's most popular worldwide franchise, it looks like many of the old action adventure and RPG series are getting a second wind. In this post, I want to focus on a game no one ever talks about and yet is very much a classic like the above series. It is a game that had been unceremoniously forgotten over the years, partly due to Square Enix's massive incompetence since Hironobu Sakaguchi left back in the early days of the PS2. I don't think I have to point out just how big Square Soft was back in the day. In the SNES and PSX days they released classic after classic. Just to name some, they made Final Fantasy II (IV) and III (VI), Chrono Trigger, Secret of Mana, Live A Live, Super Mario RPG, Secret of Evermore, Seiken Densetsu 3, Front Mission 1-3, Chrono Cross, Parasite Eve, Bushido Blade, Xenogears, Vagrant Story, Final Fantasy Tactics, the Saga games, Legend of Mana, and the game that broke the JRPG genre, Final Fantasy VII. But for my money, the best game they released is the one that no one remembers. I'm talking about the action RPG for the PSX known as Brave Fencer Musashi. 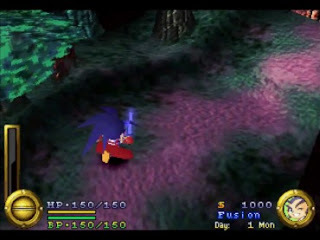 The game was originally conceived by Hironobu Sakaguchi as a story where the Miyamoto Musashi is taken to an alternate dimension and must fight his way out. He originally envisioned the tale about a wanderer pulled into a new world against his will and must fight to go home. The game turned out slightly different as instead Musashi turned out to be entirely different dual sword wielder, instead he's a sort of Good Samaritan with a rude exterior, transported to a strange kingdom and willing to help anyone despite how it inconveniences him. Where this Musashi (or Sir Musashi as some call him) actually comes from is a mystery and is never explained. Initially released with a demo for the craptacular Final Fantasy VIII, this game is not known for much else even though it was Square's first fully polygonal game. BFM had high reviews at the time, but it was glossed over due to the high level of quality games Square were constantly putting out at the time, and that is a true shame. Brave Fencer Musashi was released around the same time as The Legend of Zelda: Ocarina of Time and while that classic overshadowed this, I would say that I had far more fun here. I can't even count the number of times I've replayed this game over the years, it's just that good. You might notice something familiar about the character designs. That's because the characters were also designed by Tetsuya Nomura, though as the picture above attests, they are way more visually appealing than his later designs. I still contend that Musashi (this Musashi, not the other one) is his best designed character. So what is Brave Fencer Musashi? It's an Action RPG about a teenage punk with a height problem named Musashi. He is summoned from another world by Princess Fillet in order to save the Allucaneet Kingdom from the evil Thirstquencher Empire. From the names you can tell there is a lighthearted edge to the story, but that's only part of it as it does get quite dark at times. The atmosphere varies from bouncy adventure, to menacing dungeon romp, to crazy action set piece, over and over again. In his journeys Musashi must also save the lost residents of the kingdom, trapped in Bincho fields, before the Binchotite runs out and he is unable to ever return home. Oh, and it might also kill him. Musashi turns out not to be the Musashi of legend, but a very different sort of warrior named Musashi. I think this is an improvement on the original idea. You see, while he might not be Miyamoto Musashi, he is a swordsman, and he is unrelentingly strong and agile. He also has a snotty sense of humor, a love of fighting, and only initially agrees to the quest to return home despite being a very good guy at heart. We never learn anything else about where he comes from, other than his rival Kojiro (Not that Kojiro, either! ), or his past but that only brings him across very strong on first impression. He's a character you want to play as and root for. That's partly why I became a fan of him within the first half hour of gameplay. What first sold me on this game was the entire first segment of the game. Let me paint a picture for you. 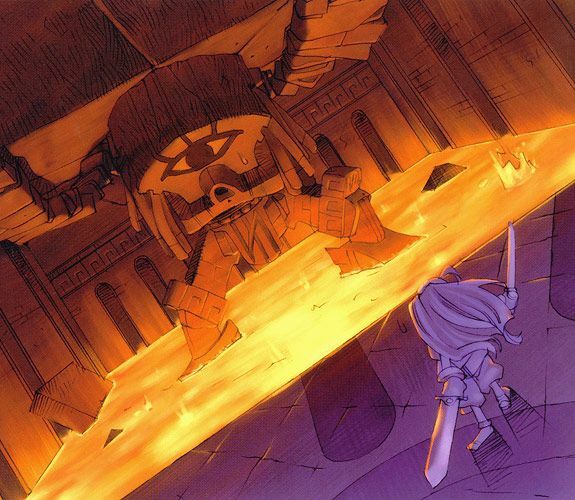 Musashi is chewing out the residents of the castle for taking him out of time and space when he is directed to the creepy tower behind the castle where the legendary sword Lumina is held. If he uses that sword he can slay the evil that is on the way to the castle at that very moment. He agrees and runs off without any hesitation. He heads to Spiral Tower in search of the sword first by crossing an eerie forest and slaughtering plant monsters, hopping over streams, and tossing Thirstquencher thugs around like sacks of potatoes. Then he reaches the tower, which is not a tower at all, but a small stone structure with giant statues erecting some kind of barrier around a huge rock head in the center. After destroying the statues, the tower ascends from the center, taking the head to the top. Musashi goes into Spiral Tower meeting ghouls, bats, and spooks on the way. He quenches the flame with a huge bell, bringing back light to the inside and unlocking the way forward. Finally he reaches the top of the tower here he sees the head from before sealing the sword in another barrier. He breaks it, and finally has the legendary sword! Before he can descend the tower, the stone head goes berserk and fries the top of the tower. 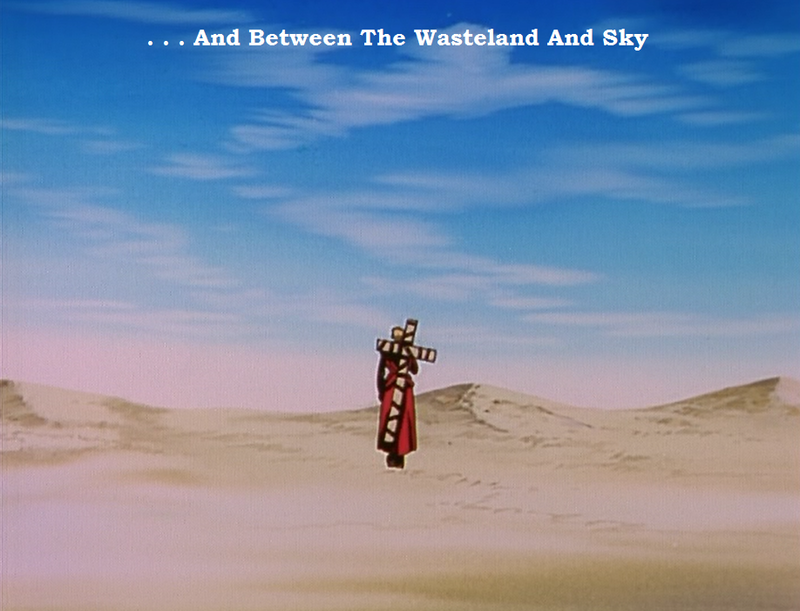 Now Musashi runs down the side of the tower as the destroyed head rolls down after him in pursuit. He must also hop stone ledges or become a Musashi sandwich. Finally after jumping over the ledges, and outrunning the head, he lands safely on the ground. And so does the head! It chases him back through the forest crushing all the enemies and obstacles Musashi had fought on his way there the first time. He hops more structures and streams on his way back to base. The sun sets as the head finally lodges itself in the castle wall as Musashi finally makes it back in one piece. Or does he? Finally returning (after smashing a hole in the wall) he meets the villain Rootrick who has just captured the princess. It seems the earlier attacking force has finally breached the castle walls. Before he can do anything, the bad guy makes off with the girl. At the same moment a giant monster named the Steam Knight smashes through the ceiling. The huge robot has four legs dispersing steam, a love of oversized wrecking balls, and a hatred of heroes. So what does Musashi do? He smashes the legs with his swords, then he throws the giant monster through the castle wall. He chases it down through the village, then throws it through the courtyard house and onto the next street. As it struggles valiantly against the pint-sized hero, Sir Musashi tosses the gargantuan hulk through houses and off a steep cliff. Then to make sure its dead, Musashi throws its own wrecking ball down from the incredible height, finally crushing it and making it explode. Then he falls asleep on the side of the cliff. Oh, and none of that was a cutscene. It was all playable. 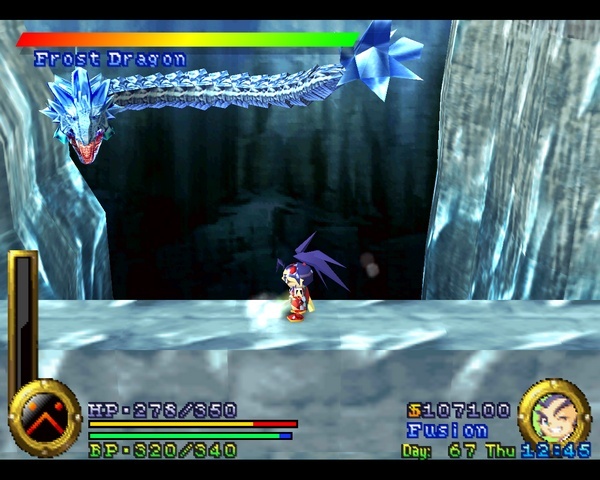 Speaking of playing, the game was designed first as an action game with RPG elements to enhance the experience. 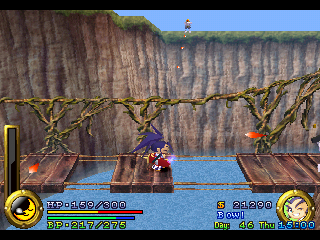 Musashi has two swords, he can buy items, and he can jump. He can level up his basic abilities as well as find new gear that can give him more moves. So you get a lot of action, puzzles, and even platforming throughout the adventure. The dungeons and bosses are all invigorating to explore and fight, and the rewards you get for beating them are always worth the struggle. It also helps that the controls are tight, and the music is big enough to carry the epic scope. One interesting wrinkle is the fatigue system. Musashi gets tired running around all day. Because there is a day and night system (with enemies coming and going at different times, and the townsfolk having schedules... same year as Ocarina of Time, remember) Musashi will eventually get sleepy. The longer you are out, the more his meter goes up. 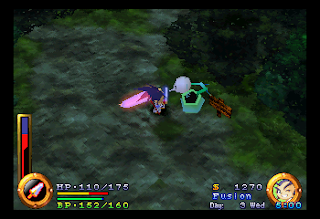 When it gets to 100% he will randomly fall asleep, even in battle, and he will move extremely sluggishly. You can bypass this by falling asleep just about anywhere, but your percentage will never drop below 30% unless you visit an inn or the castle. Oh, and enemies can attack you while you sleep. So it's not always a smart idea to sleep outside. As mentioned before, Musashi has two swords. When he powers up Lumina with the Five Scrolls he can unleash its full power with different magic skills. That paired with the katana named Fusion, which can absorb skills from enemies, makes him a force to be reckoned with. He can mix and match for a lot of different combos in battle. Musashi is a one man wrecking crew. And that's why Brave Fencer Musashi succeeds so well. You really feel like you are in the role of a legendary warrior summoned to save a world because the hero is really that incredible. He's a tough talking loner with a heart of gold, but he throws giant robots through walls and slays ice dragons in between naps. Its a game where every jump, solved puzzle, and landed hit jut feels satisfying. Square has never made an action game nearly as satisfying as this one is. Square would go on to make another action RPG named Dew Prism (Threads of Fate) and a sequel to this called Samurai Legend Musashi (which reflected PS2 era Square really well: it was insanely bland and missed everything the original did so well) but they have never come close to Brave Fencer Musashi in fun factor or sheer spirit. Its also never been rereleased overseas. Possibly due to the surprisingly good voice acting (with VAs such as Mona Marshall as Musashi and Steven Jay Blum in several roles), Square has never even put it on PSN, depriving the classic of further recognition. That is the true tragedy here. Much as I would like a remake that simply updates the polygons and leaves everything else alone, I don't see it happening. I also foresee game critic and modern Square Enix fans turning their nose up at it. 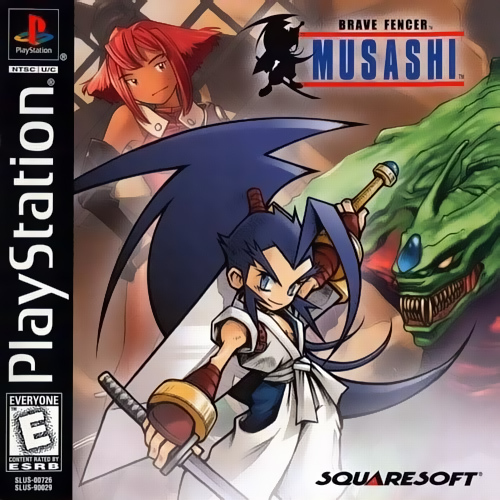 Brave Fencer Musashi came out in a very different time in the gaming world and would probably not go over well today. But it is a classic, and I feel no shame in saying so. If you missed out on it back in 1998 then you missed out on something great. Rectify that. You read that right, the last book in Declan Finn's Dragon-nominated four-part vampire saga is here! 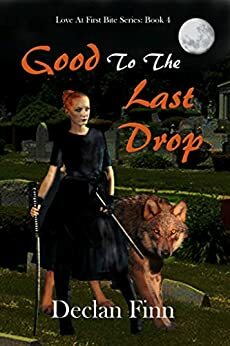 If you want a fast-paced, and fun, vampire series where vampires follow the rules and yet are still incredibly intimidating then this is the one for you. The series contains elements of horror, science fiction, and fantasy, which is more than welcome these days when genre boundaries are guarded like Fort Knox, and engaging characters that you want to root for. This is a tight old school vampire usage which hasn't been seen in the genre world since at least the 80s. I'm nonplussed to think of a series of vampire books I have enjoyed more than this one. Most of them either go goofy with the mythos or the creature, or the story looses focus. But these books are tight and to the point. I'm certain the last book will be more of the same. "Merle Kraft, Marco Catalano and Amanda Colt have battled against the mythical Council, a supernatural conspiracy that monsters fear. This war has brought them up against vampires, minions, and demons from Hell.. Along the way, they have accumulated allies among the police, the military, the mafia, college students, lowly street gangs, and even other vampires. "Marco and Amanda have overcome their biggest terror -- their passion for each other. "But now, they face the final threat, one that is the culmination of every threat before them. This creature from Hell has powers beyond anything they’ve ever seen before, and has allies of his own: including SpecOps minions, an army of vampires, and packs of werewolves. "And that was before Marco got bit." You can read my reviews for book one, two, and three,in the links provided. Suffice to say, I was a big fan of all three. I will be reviewing this one eventually, but I'm pretty sure it will be as worth your time as the first three books are. And good luck to the author in the Dragon Award ballot. As far as new series go, this was one of the freshest I've engaged in in years. If you haven't dove in yet, this is your chance! You've been waiting for this. Forget everything you've heard about this series. Forget the fans, forget the haters, forget the hype, and forget the anime. This volume right here is the one to get if you want to understand why My Hero Academia has managed such a foothold in the post-Comic Book world of the West where everything else has failed to catch on. This is a real story about heroes. This is the type of book Marvel couldn't even dream of making these days. 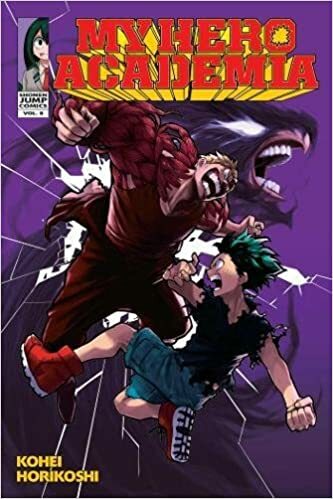 If you want to know why this series is so popular, take the character of Izuku Midoriya on the cover above. When the series started he was only a dreamer, completely unable to take his place in the world or achieve his dream. All he had was big talk with nothing to back it up. He was bullied, he was weak, and he was pathetic. I've heard some people quite nearly giving up on the anime after the first two episodes because of how they hated following whiny protagonists. Surely Midoriya was just another one of them. If only they could see this volume. In volume 9, you not only see some of the villains at their worst, you also see the heroes at their best, and no one is more at their best than Midoriya is. Chapter 76, titled "My Hero", might be the single greatest moment in the series thus far. Remember that whiny weak kid from chapter 1? He's gone now. Remember that kid who couldn't use his power without almost killing himself? He can fight now. Remember how he was just a sniveling brat who could never be a hero? Not anymore. Remember when they said this series was a lesser version of Naruto? They were wrong. They were dead wrong, and ooooooooh boy were they wrong. One look at hat cover tells you all you need to know about this volume. With the chapter entitled "My Hero" in this volume, Izuku "Deku" Midoriya has officially become one of Shonen Jump's best protagonists. He is up there with Kenshiro, Goku, Seiya, and Kenshin Himura, and all the other genre classics. And he did it by being a pure and unadulterated hero. Blood, sweat, and tears, through nine volumes has led to this moment. Here he is to remind everyone why he is the successor to the greatest hero of all time. This volume more than anything is Kohei Horikoshi at his best. He's been on fire ever since the end of the Sports Festival and Stain showed up on the radar, but he's even more on point here. It's mystifying that one man can write superheroes better than anyone currently at the big two superhero companies, but he manages it with aplomb. He only gets better and better as a writer and artist, too. Unlike most modern writers, Horikoshi believes heroes are heroes because of what they do. He believes villains are the same. In this volume you will see heroes who do good and villains who do bad, how they clash, and how and why one of them will come out on top. There is no grey area here, and it is refreshing in this murky morality modern entertainment is filled with. And, not to spoil, but this arc leads into probably the single most important event in the series so far. Volume 10 and 11 will be total game-changers. It only gets even better from here. If you aren't reading this series then by all means jump on here. Season 3 is almost certain to start on this volume when it starts next year, so get your foot in the door. If you want to know whether My Hero Academia is a fad or not then ignore the hype and pick up this volume. You will not be disappointed. And did I say what a great cover that is? Eh, I'll say it again: That is an excellent cover. My Hero Academia is the best manga currently running, and it is only improving. Now is the time to jump aboard. Don't miss out on the best hero book currently running. 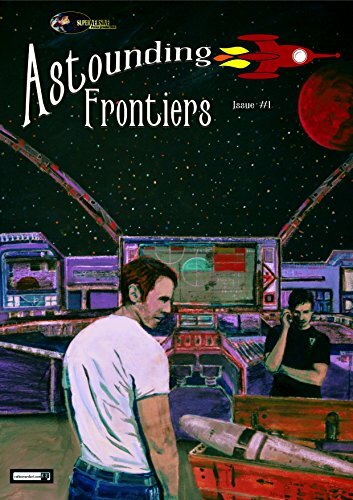 To Pulp or Not to Pulp ~ A Review of Astounding Frontiers #1 and a Bonus! The magazine itself is also very well edited, and the writers all contributed very good speculative stories that wouldn't feel out of place in a Science Fiction magazine from the 1970s. I did not read the serials simply because I do not like serials as a rule, but know that all the authors involved are very capable at writing great stories and from what I've seen these serials continue the trend. If you buy this issue you will get your money's worth. It is a 5 star magazine with very worthy stories. It has a fantastic title and tagline, too. Very well put together. All in all, it's a great buy. As I said, I didn't read the serials. This is nothing against either the magazine or the writers, but just that I don't read serials. My memory is bad enough that waiting even a week to read the next block of a story will cause me to lose my excitement and the story thread. So anything I say next will exclude them from criticism. The cover is boring. I don't have any idea why those guys are standing around amidst computer screens and blandly looking around. There isn't any wonder or mystery to be found on the cover and it dulls enthusiasm for opening the issue. Luckily, issue 2 is a step in the right direction here. This leads into the biggest problem I had with the magazine: it's not traditional Pulp. Keep in mind that there are no bad stories here. They're all well written and do what they do well, but they are not Pulp stories aside from According to Culture. The reason they're not Pulp is not just because of lax pacing (the first story in particular is rather quick and it is not very Pulp either) but that there isn't much mystery or wonder at the world outside of the characters. There's no genre bending (though again Finn's comes close), and there are no moral conflicts that tie in to the exterior battles-- if there are exterior battles at all. In other words, it's Science Fiction done in Heinlein's Silver Age style. 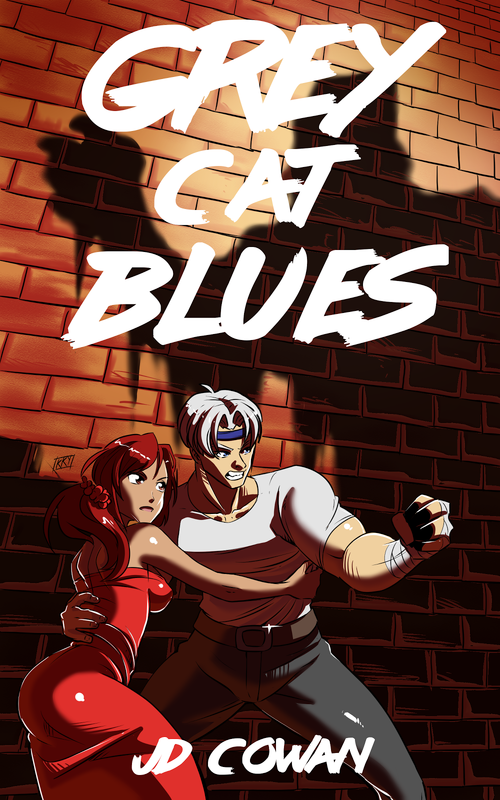 Not Golden Age Pulp in the vein of Robert E. Howard, C.L. Moore, Clark Ashton Smith, or Leigh Brackett. The lack of romance (in the older sense) is a big deal for this reader. I read Golden Age Pulp for the excitement, the off-kilter ideas, the wonder, the action, the mystery, the smashing of genre walls, and the morality and spiritual battles. I don't tend to read Silver Age SF because it barely ever has half of those and I personally don't care about complex math equations to tell me how faster than light travel works. Pulp naturally focuses on everything from the bottomless well of the soul to the near inscrutable atoms of the universe and everything in between, while Silver Age focuses on How Things Work and how Making Things Work will solve every problem. They have very different aims. There's nothing necessarily wrong with the latter, and it wouldn't be an apt criticism normally. But this magazine was advertised as being a Pulp magazine, and my expectations were adjusted accordingly. In that aspect it doesn't hit the mark. Part of the problem is that all the stories are locked to Science Fiction. Pulp is not just Science Fiction. Pulp is Fantasy, Horror, Science Fiction, Historical Fiction, Thrillers, Alternate History, Weird Tales, Westerns, Detective Fiction, and Romance. It can be any of these at any time, and all at once. There are no genre boundaries in Pulp, and it is one of the unique characteristics that only it contains. Limiting that scope limits the potential stories for the audience. That's not to say I disliked the stories actually in the magazine. I enjoyed them all. But they did not offer what I was expecting, and I can't help but feel a tinge of disappointment. To put it in contrast, let me use this space to review two other short stories I have read recently. These are the types of stories I went in expecting from Astounding Frontiers. The first is I, The One by Dominika Lein. The second is Spider Silk from J.D. Brink (fantastic name, sir) and both of which I had to purchase in the cluttered asteroid field that is amazon's site just to read. I've been looking for a way to properly review them, so it'll work here. These are the sorts of stories that should be in a Pulp magazine. I, The One is very hard to pin down. Reading the first paragraph one cannot discern if it is Science Fiction, Fantasy, Horror, or something else. It's quick and snappy: events continually unfold and unravel the world within. The prose is light and yet ropes you in to hold you to the page. Imagine Clark Ashton Smith with an eye on the more mystical parts of the Dresden Files and you might get close to what this story is. It was a delight to read. On the other side is Spider Silk: Behind the Eightball by J.D Brink. This is a fast paced action story about a superhero hunting wannabe supervillains. It's got a good sense of humor, a swift flow, and is a quick read. It's not anything like I, The One, and yet it is very clearly pulp inspired. About the only personal gripe I have is the excessive swearing, but that is relatively minor compared to the rest. This was fun on every level. But the best thing to get out of what I said is that these stories are entirely different from each other in just about every way. And they're both still Pulp. That is how wide the net casts. Pulp has an incredible scope. This is why I expect a lot from a Pulp magazine, and will be expecting more in the future. Astounding Frontiers is a good magazine, with a good foundation for the future, but it is not a Pulp magazine. Not yet. 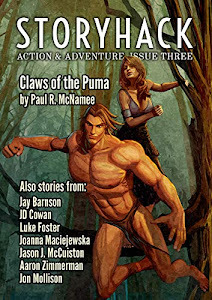 If you are looking for a Science Fiction magazine: Recommended. Whew boy, I didn't expect that last post to blow up the way it did! Thanks to everyone who read linked, or commented, to it. It's nice to see that my rambling isn't always being absorbed by the void. Now it's time for an update on just what has been going on with me. These posts are doubly fun because I get to tell you what's happening, and at the same time organize my thoughts. A lot's been going on behind the scenes. I currently have three short stories out for submission. I'm still waiting on word whether any have been accepted or rejected yet. Hopefully I should have an update on any of these in the near future. In other news, I've also finished editing another short story I got back from my second editor. I'm also deciding on where to send that. This one was a bit different than my usual: it's my attempt at more of C.L. Moore joint. It was tricky to put together. As for projects done, I have a novella/short novel done, but I need to wait for my editor to have some free time to give it the once over so I can put the finishing touches on it. Once I get that back and edited, it will be ready to go. But, unfortunately, I don't see that happening by October at this rate. I just started a short pulp superhero novel that I outlined (this might be the first time I follow an outline all the way through!) that I also hope I will have finished and out by year's end. But again, that will depend on if my editor has the time. Nonetheless, I'm liking where this one is going. As for book 2 of Knights of the End, that one is still on the back-burner. The truth of the matter is that while the reception for it was surprisingly positive for a first novel, it hasn't done quite well enough for me to need to rush a sequel out. It's still being written, but it's not a priority. I have to give the audience what they want, and my short story from the Crossover Alliance has gotten the most positive audience reaction out of anything I've ever written. So that's the direction I'm going in for now. But the follow-up will eventually happen. In other news, a friend and myself are playing around with an idea that has me a bit excited. If all goes according to plan, we should have a blog for it up by September. And before anyone asks, it's not writing related (at least, not directly) but it should be a lot of fun. We need to get all our ducks in a row first. Stay tuned for that. Also been making slow (glacially slow) progress in regards to moving. Of all the events I have listed so far, this is by far the least likely to happen this year. But, who knows. Please pray for me that I can work it out. It's tough organizing something like this. Basically, I'm saying to sit tight. I do have things coming! I really haven't been sitting around twiddling my thumbs over the past half year. 2017 has been a very productive year for me, and I'm hoping I can show you all the results sooner than later. And thanks for visiting. I appreciate every visit and comment from every one of you. There's been an odd sea over change in the last week. I've noticed a lot of people regardless of age, political affiliation, tastes, country of residence, or general interest in pop culture, appear to be arriving at very similar conclusions. That consensus is that there is something very odd going on right now. If you haven't been paying attention, I'll sum it up as best as I can. We'll start with comics. The recent San Diego Comic Con, best I can tell, appears to be ground zero for this attitude. The reason? There wasn't anything of value announced, and what was made blatantly clear that the industry is dangerously low on ideas and people are becoming aware of it. Not only does he mention how the Eisner Awards have become just as worthless as the Hugo Awards, or any other industry award, but he goes into detail on what was shown there. The answer is nothing much at all. Comic sales are cratering, and insiders are busy giving awards to each other and refusing to acknowledge the problem. Then there's the media refusing to report on any of this and pretending everything is just a-okay. Diversity & Comics has since been assaulted by Marvel writers and editors online telling him that only certain fans are welcome to buy and read their comics. This is not how a functioning business or service is supposed to operate. These people are shrinking the industry deliberately. But it goes further than comics. Superhero films are hitting the wall. Not only have there been countless articles hoping for the death of this genre for years now, actual fans have been noticing their interest declining as well. Marvel movies are not pulling in the same amount of praise and bucks they used to. By the time Marvel finally finishes Phase 3 with Avengers: Infinity War and the end of Kevin Feige's contract, we could be looking at the end of superhero movies. Every genre has its day, and superheroes have already had theirs. The clock is running out. He's right. All pop culture fads go through phases, and most have a 10-20 year saturation point. X-Men started the comic book boom in 2000, which is 17 years, or if you want to be recent, Iron Man was in 2008, which is 9 years. Either way, the wall is dead ahead. We're hitting that point. And this is a bigger problem for Hollywood than you would think. People are going to movies less and less as it is, but now people are growing tired of the one thing they've been going to see in droves. The last thing I wanted to point out was this blog post by Kestutis Kalvaitis which is a good sum up of everything so far. "Every major multimedia franchise that's been marketed to Hell and back harder than Dante and Orpheus going on a bus tour is exhausting itself. Let's explore." He then goes on to describe the state of Marvel, DC, Star Wars, Dr. Who, The Walking Dead, Live Action Disney, Game of Thrones, and Harry Potter. Go give that a read. I'll wait. But childhood is over. Star Wars movies ended in 1983. Chris Claremont doesn't write X-Men anymore. Kurt Cobain is dead, and so is radio rock. Dr. Who has been treading water creatively since its reboot. These properties have had their stories and songs written and told. They are done. Now it is time for new franchises and new stories and for the baggage to be left behind. It's time to stop pining for a childhood that is over. Hollywood has been telling audiences what to like for decades, but there have always been smart folks in the system willing to get around the suits and give the audience what they actually want. Star Wars was Golden Age pulp that bypassed the acceptable Silver Age sci-fi literature at the time. It ignored the grimdark Hollywood movies and gave the audience their good vs evil stories back again. It was a major hit and phenomenon as a result, causing an explosion in genre films throughout the 1980s. All it was was a battle of good and evil with really good guys and really bad guys. It was straightforward and it was honest. But Star Wars isn't that anymore, Rogue One even went out of the way to destroy that aspect of the series, and Disney is milking the nostalgia for all its worth. Something new needs to arise. The 1980s brought out action movies, and before that were westerns and film noir. All of which brought in audiences and made a killing. But they quickly went out of fashion when their cycle was up. No problem, the creators and audience moved on. We still have those stories, and there was always a chance those genres could make a comeback. But as has been said over and over, Hollywood currently has nothing at all. They have soppy victim complex dramas, lame comedies, and loud, crude kids movies, and that's pretty much it. Audiences are sick of all three. So what is working, then? John Wick was a hit, but it still hasn't caused any imitators to pop up, which rules out a return of real action movies. Pixar has been hobbled in a never-ending cycle of sequels, for some reason. And as already mentioned, superhero movies are yielding less and less returns. So what else is there? This post is going off the rails here, so please stick with it. The following is just speculation. Maybe we have reached the end of pop culture. People are more fragmented than ever before, whether by location, by situation, or by taste, and there are no real universal values that bind them anymore. Radical individualism has caused an untold number of offshoots of taste, and it doesn't look like they are ever to link to the whole again. The last link people had to each other in the (post)modern age, was pop culture. The turnabout on nerd blackface has been a long time coming, and that ancient pop culture youth the bazingas constantly speak of to soothe you and your childhood acquaintances into a soft trance is no longer working. It's wearing off. Nobody needs to go to the movies anymore. Nobody needs to buy a Big 5 published book anymore. Nobody needs to go to a music store anymore. Nobody needs to buy Marvel comics anymore.Heck, to be pedantic, there are many people who don't buy anything anymore. There's nothing there to bond people anymore. Pop culture as a whole might be over. That might be an insane proposition, but it isn't that crazy. The world gets more fragmented and divided everyday, and that is not set to change anytime soon. In the past pop culture was a way to help relate and share values among each other and remind the audience that they were a community. It was a way to unite. Pop culture apart from the culture destroys any reason for it to exist. How can there be popular culture if it's not popular and there's no culture to relate to it? We may be witnessing an unforeseen change in the entertainment world. Things might never be the same again. Whether that is good or bad remains to be seen. But it doesn't look as if the major studios and companies will be part of this new era. And that is good. Dead weight should always be cut so the survivors aren't left to drown.